We provide fairly priced, good quality haircuts, colours and scalp treatments, which our clients receive while experiencing art. 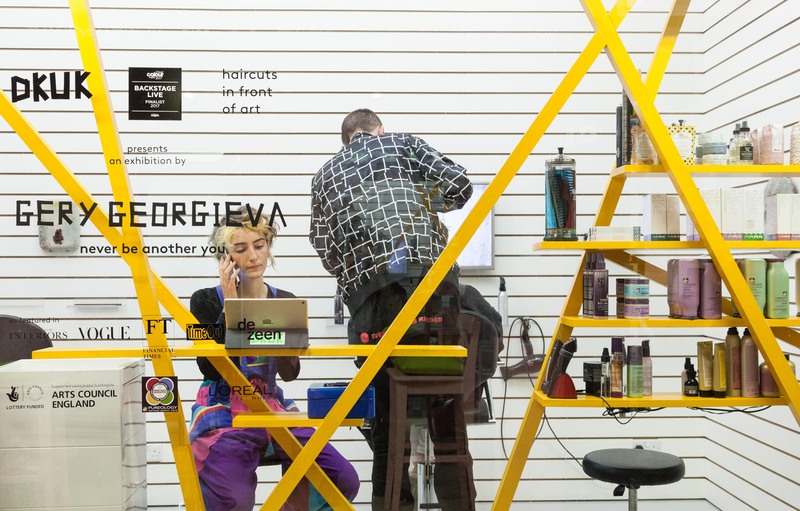 We exist to make viewing and discussing art more commonplace, and support artists by commissioning works from them and training them as hairdressers. We are growing to be among the most creative hairdressing companies in the sector. If this sounds like a good place to work, then believe me it is! Many of our clients are artists, creatives and lovely so we do lots of interesting haircuts and have many fascinating conversations. We are constantly challenging ourselves with workshops, extra training and photo shoots which blur the boundaries between hair and art with some of our staff also working as artists. There will also be opportunities to travel – to date we have done pop-up exhibitions internationally in Norway, The Netherlands and Brussels and nationally in Glasgow, Leeds and Barnsley. We will soon be moving to a bigger space with increased visibility and footfall and we have long terms plans to franchise the idea so one day you could open your own art gallery hair salon. Apply to dk@dkuk.biz with a brief cover letter and CV deadline 15 September and please do come and check out the space.